There are a lot of images today, but the theme is kind of loose. Except for the wallpaper there are three examples of American art and one U.S. historical map. 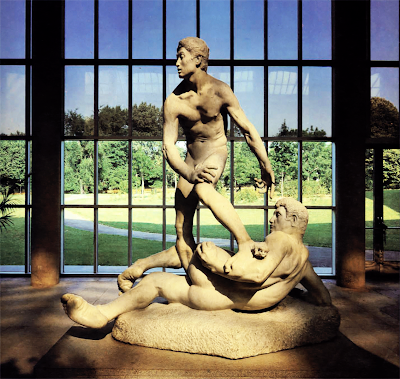 Struggle of the Two Natures in Man by George Grey Barnard, 1894, marble. If you ask people to name a sculptor or two they’d probably say Michelangelo or Auguste Rodin. Other than Egypt’s Great Spinx, those two men also created what people think of as their favorite sculptures. Even in his time (1863- 1938) Barnard had to fight the massive shadow of European sculpture. In the Two Natures he may not have achieved the fame of some works like Rodin’s The Thinker or Michelangelo’s David, but he did achieve the grandeur and profundity. There are two figures, but really one man. One, the standing figure, the enlightened rational man, rising up from the man of base desires. 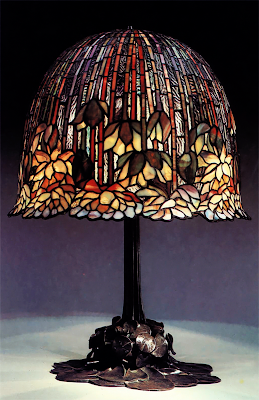 Lamp by Tiffany Studios (1902-38). Tiffany was established by Louis Comfort Tiffany (1848-1933) in Corona, new York. Lamb made around 1910. Bronze with leaded glass. 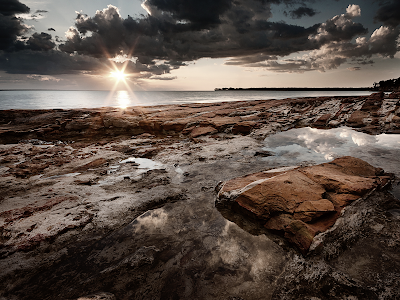 This one had bulbs at two levels in order to create the effect shimmering light on water. The detailing includes lily pads, bamboo and lotus flowers. Some of the glass piece work is clear while others pieces are opaque – the colors range from rose, vermilion, pink, aquamarine, teal and turquoise.The problem I have with Tiffany lambs is not the lambs themselves, but that they’re part of the Victorian era and are used in Victorian style houses with other Victorian decorative pieces, including furniture of course. I can’t stand Victorian furniture or houses, generally. Its rare, but there are people who have a phobia about Victorian era furniture. I can understand why. It is the kind of furniture that will strange you while you nap. It has a creepy quality about it. I don’t mind it in movies to add atmosphere, like the Sherlock Holmes movies with Robert Downey and Jude Law, but I would rather not be around it in person. 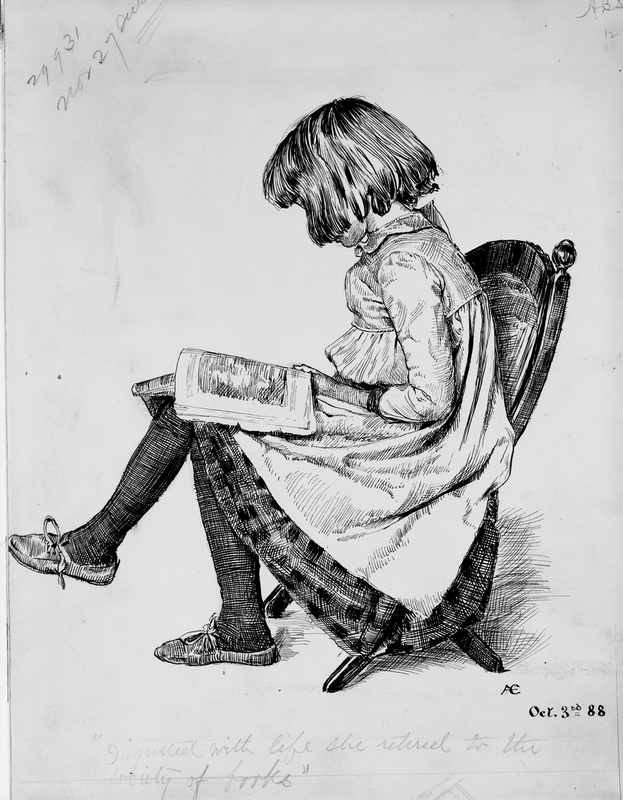 “Disgusted with life, she retired to the society of books” by Rosina Emmet Sherwood (1854-1948). Pen and ink, originally created in 1888. There is a good write-up on Sherwood here. She would have been a contemporary of Mary Cassatt. This illustration was published in Harper’s in a 1889. The title has sound like something a precocious child might express. “A Map of the Land about Red Stone and Fort Pitt,” Used by George Washington. 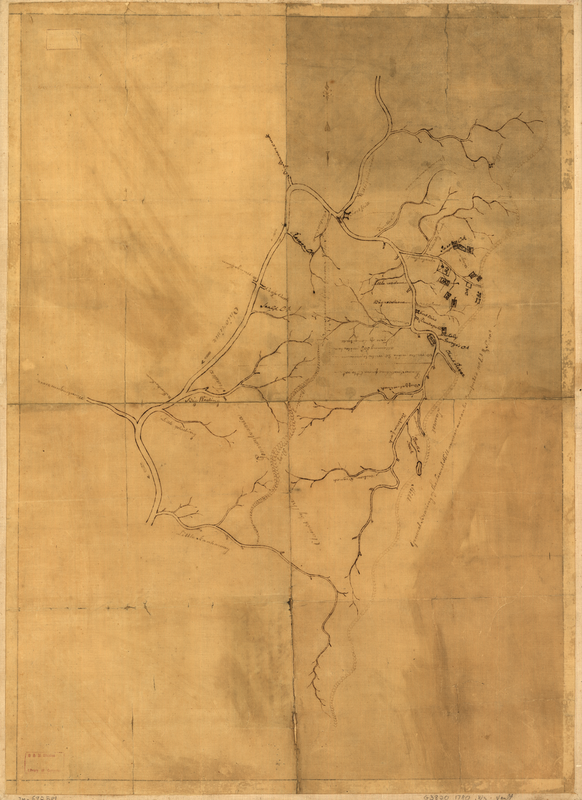 The author and date are not known, but the map appears to have been made sometime between 1758 and 1771. The back, which i do not have, has hand written annotations by George Washington. One note reads reads: “A map of the land abt. Red Stone and Fort Pitt, given to me by Cap. Crawfd.” Fort Pitt was built by the British. Red Stone probably refers to a stockade built in 1759 on a hill overlooking the Monongahela River south of Pittsburgh. Corporate Profits Hit Record High While Worker Wages Hit Record Low. The only thing that could generously be called a counter proposal to president Obama’s budget is playing around with the Medicare age of eligibility and snipping some inflation adjustments off Social Security. One of the big things that could be done to put those programs on an even more solid financial footing ( they’re in good shape but could be better) is to pay workers a living wage. They would in turn contribute more in payroll taxes. Conservatives and libertarians know this, thus fight any attempt to increase minimum wage or increase taxes on the top 10%. It’s hard to escape the feeling that Douthat is talking about women when he talks about “late-modern exhaustion”— after all, this is a column about birth that only mentions women in their capacity as potential marriage partners. When comes down to it, Douthat’s worry isn’t that there won’t be adults who want to raise children, it’s that not enough women are committed to having them and raising them. He traces this reluctance to the “decadence” of modernity and an “exhaustion” from more traditional pursuits. In other words, if more women would bear and raise children, the United States might be able to preserve its dynamism. The conservative movement and a few Democrats are on their knees daily worshiping at the feet of some of the most decadent, mean-spirited, greedy bastards in history – the Koch brothers, Sheldon Adelson, Rupert Murdoch. Does Douthat even know what decadence is. Did he desperately want to use the word in his column and could only do so with a shoehorn and a hammer. Conservative billionaire CEO David Seigel, who threatened to fire employees if Obama won the presidency, built a palace that mirrors the French Palace of Versailles. When a woman does not want to have a child that is not decadence, that is called freedom. As is choosing to have one. Women are not, as far as my copy of the Constitution reads, supposed to have children to please an elitist newspaper columnist, who knows as much about demographic trends and what they mean as Micky Mouse knows about rocket science. Cleveland, East Cleveland officials seek answers after police chase ends with 13 officers firing 137 shots, 2 people dead. No gun was found on the victims or in their vehicle.